On Thursday morning, we, a group of 6, sidled into the office with our sleeping bags and warm winter gear in tow – hats, scarves, thermals and a multitude of socks. We truly believed we were prepared for the harsh winter evening we were about to endure as we slept rough to raise money for the youth homelessness charity Centrepoint… but we were wrong. There are no gloves thick enough to spare your fingers from numbness when you wake up and no amount of preparation that can protect you from the inevitable achy back in the morning. As I settled into my sleeping bag for what I was pretty sure would be a terrible night’s kip, I contemplated the severity of the homelessness issue that I notice in the area around our office in Camden. The growing number of new faces and the regulars I pass daily, without a sleeping bag, without a pillow and without a secure space at night; teamed with the increasingly inclement weather I felt moved, privileged and motivated. I could handle one night at near freezing temperatures surely? Particularly when, just the day before our big Sleep Out, I’d read government figures that show there are as many as 14,400 households in the UK that are recognised as homeless – 4,000 of those reside in London alone. It was a sobering fact, and one that made all of us more determined to try to make a difference, in the hope that us sleeping rough for one night can make a difference to people who live that reality every day. Sleep Out really put into perspective for me quite how cruel sleeping rough is for those who have to endure the bitter cold every night. Throughout the evening, we all noticed how incredibly difficult it was to get comfortable on the cold hard floor. As I rolled over to talk to the other atoms, I could see our collective breath in the air, a sign of how absolutely freezing the night would be. I realised how much we all take things for granted at home- a comfortable sofa to lounge on while we watch the TV, and hot running water for a shower in the morning. Fortunately for me, I had the company of my fellow atoms; I can imagine that the lack of these amenities is all the more difficult to tolerate when you are alone, as many homeless men and women are every night. When the wake-up call sounded at 6am on Friday morning, we were already wide awake and sore from tossing and turning all night, in an effort to find at least one position that was comfortable to sleep in. 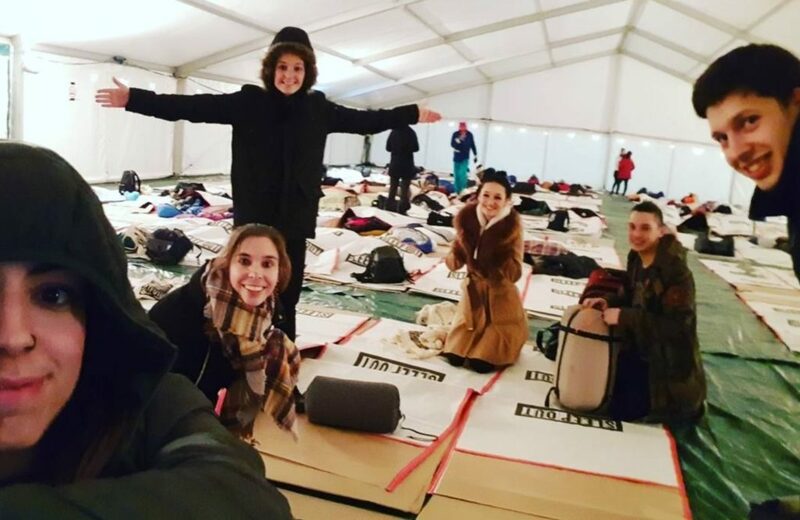 While Sleep Out was an uncomfortable, cold night it was also an eye-opening experience – just a taste of what it feels like to be homeless and something that I would definitely recommend, as ultimately it’s a great way of raising money to try to help people who have fallen on hard times.